Gladstone, N.J. – May 3, 2017 – The USET Foundation is pleased to announce a very special opportunity to support Team USA and train with an Olympian. The clinicians for this once in a lifetime “Olympian Experience” benefit package, presented by Dressage Today, are none other than 2016 Rio Olympic dressage team bronze medalists Steffen Peters and Laura Graves. 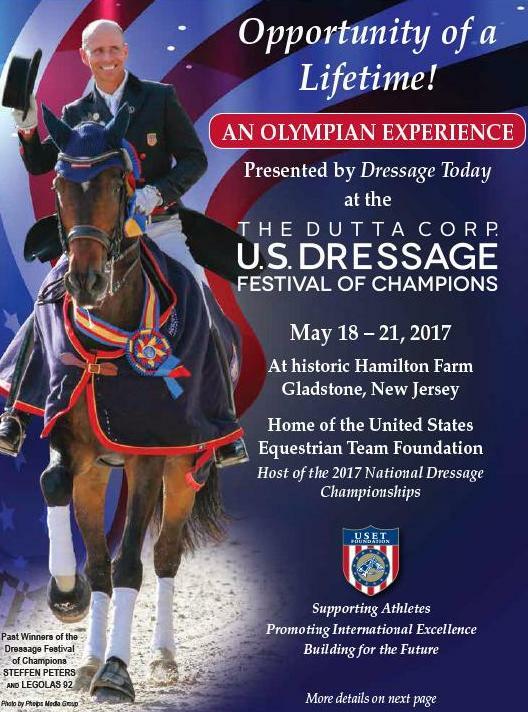 The “Olympian Experience” benefit package will also include VIP access and hospitality throughout The Dutta Corp. U.S. Dressage Festival of Champions, May 18-21 at historic Hamilton Farm in Gladstone, New Jersey. Peters is veteran member of the U.S. dressage team, having competed and medaled in two Olympic Games, three World Equestrian Games, two World Cup Finals and four Pan American Games. Graves made her Olympic debut in Rio de Janeiro, Brazil, in 2016, contributing to Team USA’s team bronze medal and earning fourth place individually. Graves also represented the United States at the 2014 World Equestrian Games in Normandy as well as the 2015 FEI World Cup™ Dressage Final in Las Vegas, Nevada, and earned team gold and individual silver at the 2015 Pan American Games in Toronto, Ontario, Canada. Most recently, Peters and Graves qualified and competed at the 2017 FEI World Cup™ Dressage Final in Omaha, Nebraska, where Graves earned a personal best score of 85.307 percent on Verdades to win her first individual medal and finish in the runner-up position behind Germany’s Isabell Werth. The “Olympian Experience” benefit package is open to riders of all disciplines who are interested in learning the fundamentals of dressage from the very best of Team USA and will include a training session on Saturday, May 20. Participants will also receive two VIP Patron tent seats and hospitality throughout the championships, two invitations to the competitors’ Welcome Reception on Wednesday, May 17, two invitations to the Olympic Celebration Cocktail Reception on Saturday, May 20, one VIP parking pass and a one-year subscription to Dressage Today. In addition, there will be a special draw for Olympian Experience participants at the Welcome Reception on Wednesday to select their Olympic trainer. The “Olympian Experience” benefit packages are $5,000 and are very limited on a first come, first serve basis. For federal income tax purposes, the tax-deductible portion of your charitable donation to the USET Foundation is $3,800. The USET Foundation’s federal tax identification number is 22-1668879. The USET Foundation is a vital part of equestrian sport in the United States. For more than 65 years, equestrian athletes have represented the United States in international competition, bringing home medals that have clearly established the United States as among the world’s equestrian elite. However, the costs of fielding international teams are enormous. Training, coaching and transporting of human and equine athletes around the world in order to compete against the sport’s best athletes is made possible thanks to contributions made to the USET Foundation. Please contact Maureen Pethick at 908-234-1251 (ext. 207) or email mpethick@uset.org for more information and to apply for the “Olympian Experience” benefit package. For more information, please visit www.dressagefestivalofchampions.org. Veterinary inspections (in order Grand Prix, Intermediaire I, ‘Brentina Cup’) – 4 p.m.
FEI Grand Prix Test – 8 a.m.
FEI Prix St. Georges Test – 11:05 a.m.
FEI Intermediate II ‘Brentina Cup’ 16-25 Test – 2:45 p.m.
FEI Grand Prix Special Test – 9:30 a.m.
FEI Grand Prix 16-25 Test – 1:30 p.m.
FEI Intermediate I Test – 10 a.m.
FEI Intermediate I Freestyle – 8 a.m.
FEI Grand Prix Freestyle – 11:05 a.m.
FEI Grand Prix 16-25 Freestyle – 3:20 p.m.